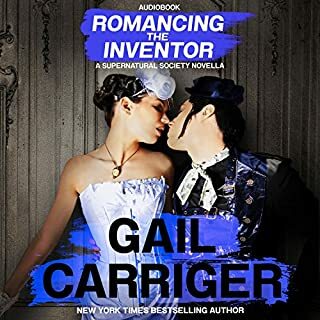 One of the things I love about the Parasol Protectorate series is how Gail Carriger parodies different types of Victorian literature with each volume. 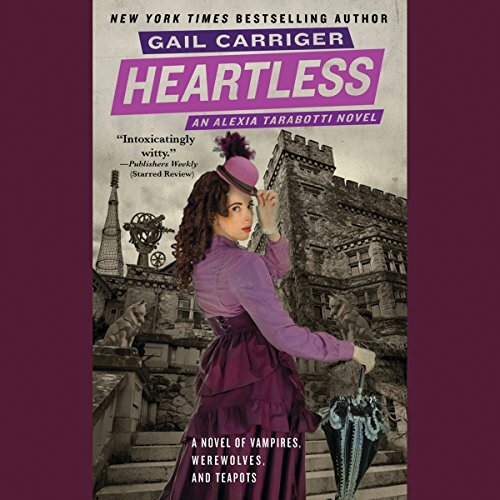 Heartless is the Sherlock-Holmes-style mystery of the group and boy is it a good mystery! I certainly didn’t figure any of it out. Due to certain circumstances that occur throughout the third book, which I will not spoil for those who have not yet read/listened to it (though what are you waiting for?! ), Alexia takes up residence in a town house next door to Lord Akeldama (delightfully foppish rove vampire), or so it will appear to the everyone. She’s actually residing in Lord Akeldama’s second best closet. 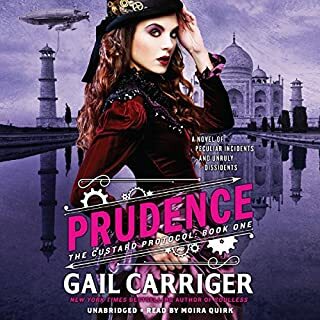 However, not long after moving in they are alerted to a plot to kill the Queen and thus, as muhjah, Alexia embarks on a hunt to solve the mystery. As I said, the mystery is a good one, particularly as it reveals some very interesting facts about Alexia’s father and about an assassination attempt that fans may remember being previously mentioned. It’s also lovely to be back in London again with both the werewolves and vampires of the town. Whilst I loved Changeless and Blameless, I did miss the Westminster Hive and the interactions between Conall (when he’s sober) and his pack. Speaking of pack interactions, we really get a closer look at the relationships of the Woolsey pack, which is something I really enjoyed, especially with how Conall is trying to handle the unexpected new member they gained at the end of Blameless. The story’s climax is brilliant. It is full of drama with so many things happening that you just can’t put it down because you want to know how it is all resolved. There were some things I found a little sad (don’t worry; it’s not what you might think!) but at the same time I am desperate to see how the new situation that arises from it will play out in the final instalment. As for Emily Grey's narration, her voice is the perfect for this story. She does a wonderful Alexia. 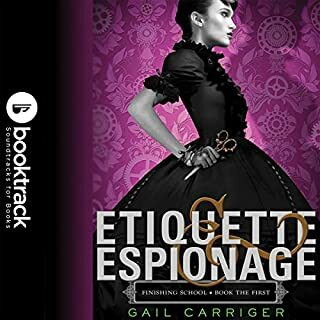 Another wonderful instalment of the Soulless series by Gail Carriger. Highly recommended. What joyous fun. The fourth instalment in the PP series, and it's just as good as the others. I won't go into detail about the story - I hate spoilers and you can get what you need from the book description - but as part of it you find out more about the Woolsey pack, its newest member and its history, Lord Akaldama, as well as the Westminster Hive. A brilliantly written book with great characters that come to life, especially aided by the excellent narrator with her many 'voices'. I'd definitely recommend this book (and series) to anyone - just be aware of the adult content. Can't wait for the next book! great fun extremely entertaining and enthralling. can't wait to read Timeless now that will fill my weekend nicely. flew through this series. Emily Gray is fantastic and her performance really reinforced the era and characters of this engaging book. Bustles, etiquette and humour. Loved it. Listen to others of the series first! Have you listened to any of Emily Gray’s other performances? How does this one compare? The last line made me laugh out loud! An excellent series, but not easy to jump into the middle of. Really really enjoyed the story and the narration. The narrator perfectly captured the characters and the intonation was great. Brilliant story in a great series. Better & Better & Better! What can I say but this is the fourth in the series & I cannot wait to start the fifth! 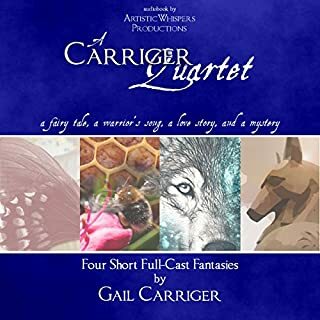 Gail Carringer just joins up each book seamlessly with a style all of her own! What s delightful story. Listening again to this dynamic & expressive reader. Looking forward to the next book. I have the first 3 books in the series, and the audiobook is proving a great way to get the fourth. I haven't reached the end yet, but the narration is perfect. The series are based on a alternative history, where supernatural beings are an accepted part of Victorian Britain. Techological innovation has gone down an alternative route of clockwork creature, automatons, dirigibles and the female equivalent of James Bond's gadgets is a parasol with extras. 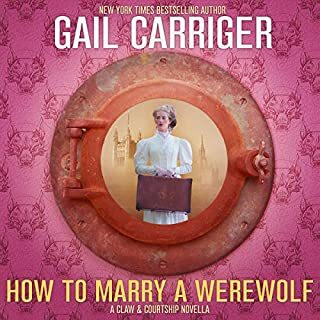 A comedy of manners, combined with vampires, werewolves and mysteries. It's not like most other books! Definitely worth a listen. Yay for the Parasol Protectorate! Love these books. They are funny and engrossing. The characters are quite lovely and well fleshed out. I thoroughly enjoyed the entire series and was quite sad when it ended. I just love the way this series is written. It's fun, propper and hilarious. The narrator is fabulous and was very well chosen. can't wait to start the next book in the series. hope you enjoy it as much as me.